Nice hotel We chose this hotel as a stopover and were extremely satisfied with the service of the owners, the exceptional cleanliness of our room and the decor of the room. Would definitely come back again and recommend to others. Facilities great, particularly for younger children. Water sports excellent and included. Reasonable food prices and drinks. Over meetings full of jargon like 'strategic staircase'? Tired of awkward hallway run-ins With Brian from accounting? You need a getaway stat. 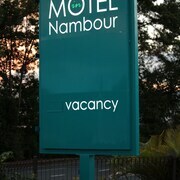 You'll be tickled pink to know you're loaded with choice when it comes to a place to stay in Nambour. If you're keen to crash within 10 kilometres of Nambour's downtown area, you'll discover 33 places that fit the bill on lastminute.com.au. Can't do mornings? Not to worry. 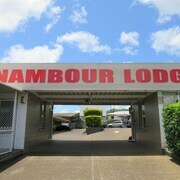 City hotels such as the Sunshine Coast Motor Lodge and Nambour Lodge Motel provide the luxury of a few sleep ins. 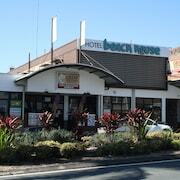 There are 53 hotels in the neighbourhood of Mooloolaba, 17 kilometres from the heart of Nambour. Check out the amenities at the Oceans Mooloolaba and Alexandra on the Pacific if you'd like to crash here. But wait, there's more! 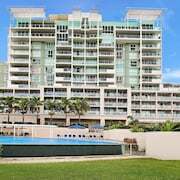 Alexandra Headland is another popular Nambour neighbourhood, chock-full of options. If you'd rather stay here, consider the Oaks Seaforth Resort and Grand Palais Beachside Resort. You might also like to stay at the Fairshore Noosa, which you'll find 30 kilometres away. Or perhaps the Spicers Tamarind Retreat, just a distance of 18 kilometres from Nambour. More choices include the Netanya Noosa, 30 kilometres away, and the Eumarella Shores Noosa Lake Retreat, 25 kilometres away. Mapleton is another place where you can lay back and make friends with the room service menu. Located 10 kilometres west of Nambour, it's where you'll discover the Flame Hill Vineyard and Kondalilla National Park. If you want to visit Mapleton, consider the rates at the Kondalilla Eco Resort and Eden Lodge. 10 kilometres to the west of Nambour you'll also find Flaxton, which is home to the At Sunrise Cottages and Hunchy Hideaway. Lake Baroon and Sunshine Coast Hinterland Great Walk are just some of the most popular sites to explore in Flaxton. Noosa National Park, Noosa Beach and the Noosa Springs Golf Club are just a few of the sweet attractions in Noosaville. This regional centre is 25 kilometres north of Nambour and has a population of 7,000. If you decide to hang out for a while, keep the good time rolling at Noosa Marina and the Tewantin Noosa Golf Club. 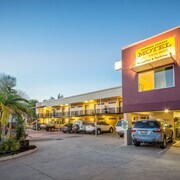 There are a range of great hotels ready for you to book in Noosaville. We recommend checking out the deals at the Noosa Keys Resort and Bermuda Villas. There's nothing worse than taxiing down the runway and wondering where on earth you're gonna stay that night. 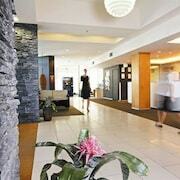 So why not sort it out beforehand and book a room at the Novotel Brisbane Airport? It's seriously close to Brisbane Airport which sits 85 kilometres from the centre of Nambour.